It’s time to prepare for midsummer night’s eve in the garden, a night of celebration for all of the garden fairies. Here at May Dreams Gardens, midsummer night’s eve takes place the night of the summer solstice which this year is June 20th (Friday!) at 7:59 PM EDT. This is the biggest night of the year for not only the garden fairies, but also the elves, sprites and other beings that inhabit the garden. For them, it’s like having all of our holidays rolled into one! This year, I wanted the garden to be ready so the fairies would enjoy themselves with song, spirits, and dance, and not with evil mischief. Not that I’ve noticed much evil mischief around the garden, but you can’t be too careful with garden fairies. I started my preparations with the miniature garden. First I moved the Heuchera ‘Petite Fairy Pearls’, featured in my bloom day post. It was a bit too big and overpowering in the front of this garden, so I dug it up and moved it to another flower bed. Yes, I dug it up and moved it, potentially stunting it. But it was just in the wrong place, so I had to do it. Plus I needed a place to plant two new plants, some Stepables® found on sale at a local garden center. Since this garden is often in the shade, I chose Veronica repens ‘Sunshine’ and Irish Moss, Sagina subulata. Please don’t tell me they are voracious spreaders! Actually, tell me if they are voracious spreaders before it is too late. I finished off the miniature garden by adding a few decorative elements and giving it a good watering. In fact, I’m going to start my catalog of all my garden plants with the plants in the miniature garden. Anyway, once the miniature garden was ready, I checked around the rest of the garden to see that all was ready for the garden fairies. 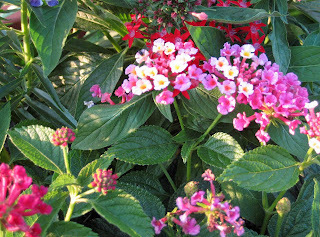 This year, I have a container of Lantana, just in case one of those Texas garden fairies snuck back to Indiana with me when I was down there for the garden bloggers spring fling. After all, Annie in Austin gave me two passalong plants to take back with me to my garden and there just might have been a wee creature hiding under a leaf. And I just remembered that now I can say thank you to Annie without worrying that it will kill the plants! Thank you, Annie! Speaking of thank you’s, I can also now thank Frances at Faire Garden for the passalong plants she brought with her to the spring fling and freely distributed. Thank you, Frances! There are several other kinds of flowers blooming in the garden now that the garden fairies should like. Many are bell-shaped, which are their favorite kind of flowers. 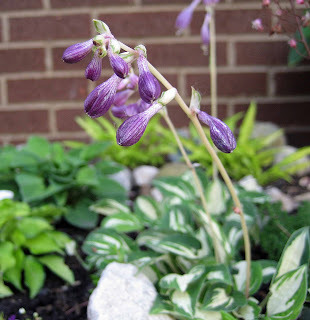 These include several different hostas, like the one in the miniature garden pictured above, lots of daylilies, and a shrub clematis. There are also plenty of vining clematis and the first blooms are opening on the Shasta daisies. They’ll glow in the light of the moon. It should be a glorious night here at May Dreams Gardens. Even Thorn Goblinfly might be out there looking for a garden fairy or two. I know both Annie and Frances will be preparing their gardens for midsummer night’s eve. What special preparations are you making in your garden for this summer celebration? Hey Carol, that's a great idea. I think that I'm going to invite your fairies over for some dust and nectar... think that will get them to spill a few more secrets--er, tell us some nice stories about you? I had a few Heuchera 'Petite Fairy Pearls' that I bought from Terra Nova Nurseries year ago when they were first released. I really liked them and was always surprised they weren't more widely distributed. I planted the majority in a sunken garden but as years went by and the trees overhead grew bigger, the absence of sunlight caused their demise. I think heucheras do better with more sun and dry conditions compared to the woodland settings and dark and damp perimeters some garden writers promote. I will partying tonight to celebrate birthdays so I am sure I will be seeing fairies. Happy Summer's night Eve. I think George in Africa is right about Heucheras wanting a soil that is not damp. That would explain why they do so well in my garden. I'll be deadheading the bellshaped flowers so as to present only the freshest flowers for the fairies. With all the Campanula persicifolias, that should take quite a while. Now I know why I haven't seen any recent evidence of fairies ... they escaped the weeks of 100 degrees by hitchhiking with you to Indiana. I may water the secret garden well, throw a few flower petals around and sneak out with a flashlight, but my Irish ancestry demands that I do this on June 23rd, using the old date of June 24 as midsummer day rather than the solstice which falls on the 20th this year. As to the passalongs, I daringly answer, "You're welcome!" 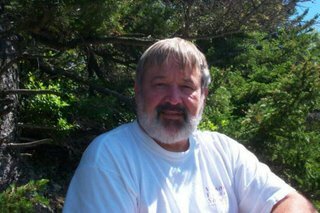 I'm so happy to have bounced into your blog, today. I love Midsummer Night's Eve and talk of faeries and etc. And sad to say, there are bloggers who frown on such. :-( So happy to have found you and your commenters, who don't frown. Take Joy, as our dear departed Tasha Tudor said. Yes, I take joy, in talk of faeries and celebrating the changing seasons and etc. :-)))) So nice to find more, who do so also. Thank you. And a very Happy Midsummer Night's Eve to you. I will go out and check for a party under the salvias and scented geraniums...I think that's where I'd be ..if I was short enough! OH MAN! I forgot all about the summer soltice! I hesitant to go out in the yard and see what mischief has resulted from this oversight on my part. Thanks all for joining in with the fun of the garden fairies. I enjoyed all the commments. 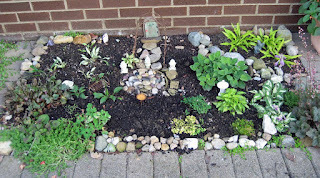 Hi Carol, good job with the little fairy garden. My troughs are little spots like that for me, so much fun to weed and tidy up. We are like Annie, and will be celebrating June 23 evening. The garden has been made as fairy friendly as possible, and we now await the big night. Thanks for the links, and you are so welcome for the plants. The ribbon grass goes dormant here with the heat and looks dead, but will come back to life with new green and white leaves when the weather turns cooler and will keep that look all during the winter when little else is in the garden.